School of Engineering, AUT University, Auckland, New Zealand. can be used as a substitute for ord inary LMS but it h as the ad ded adv an tages that can b e used fo r cons tant inp u t data (i.e. properties are much faster than LMS under certain types of noise input. cellation  and channel equalization . Despite the popularity of LMS it has a few drawbacks. correlation and the solution of the Wiener-Hopf equation. puts consisting of n + 1 consecutive outputs. te m, the control-loop output must track any such ch anges. Figure 1. 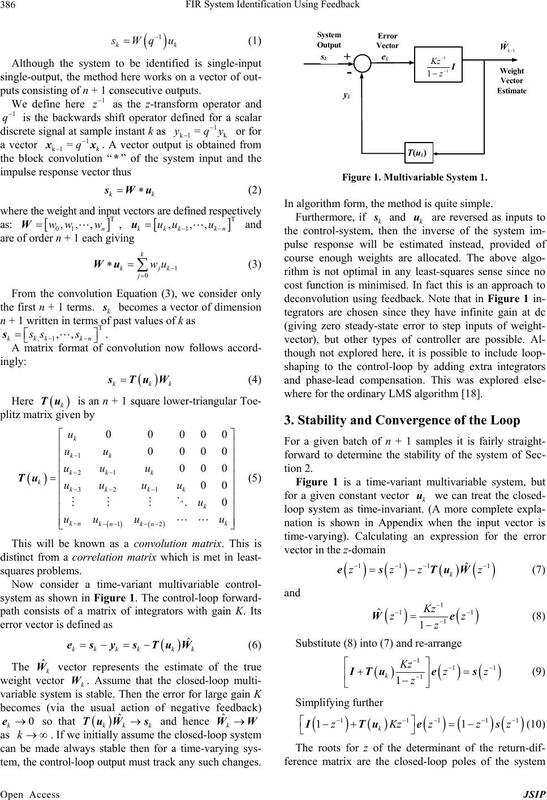 Multivariable System 1. In algorithm form, the method is quite simple. 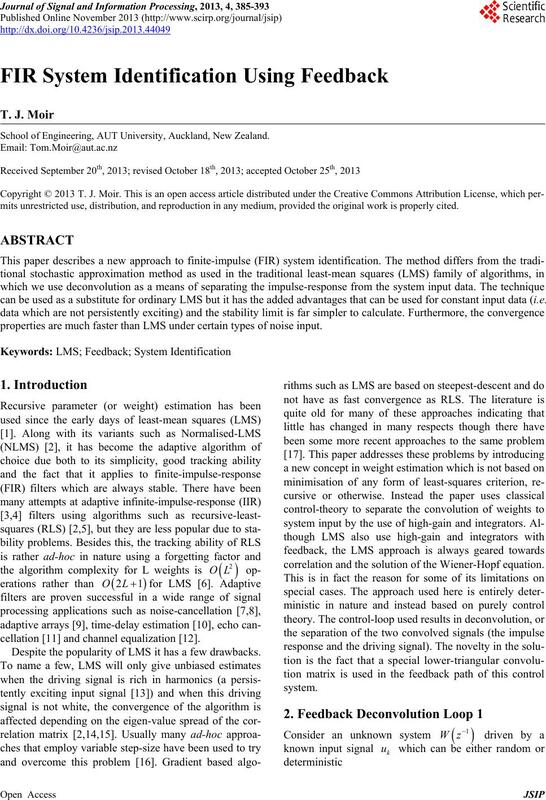 where for the ordinary LMS algorithm . is also a lower-triangular Toeplitz matrix. which the stability is dependent on. mated vector with signal vector. vided the closed-loop system is stable. Tu is formed by Equation (5). 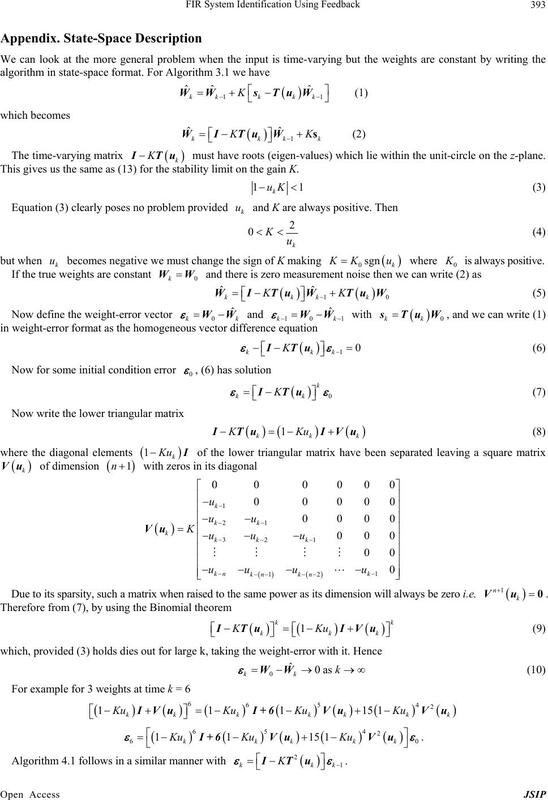 For L weights, the algorithm has operations. each vector of input data fed to the unknown system. Figure 2. 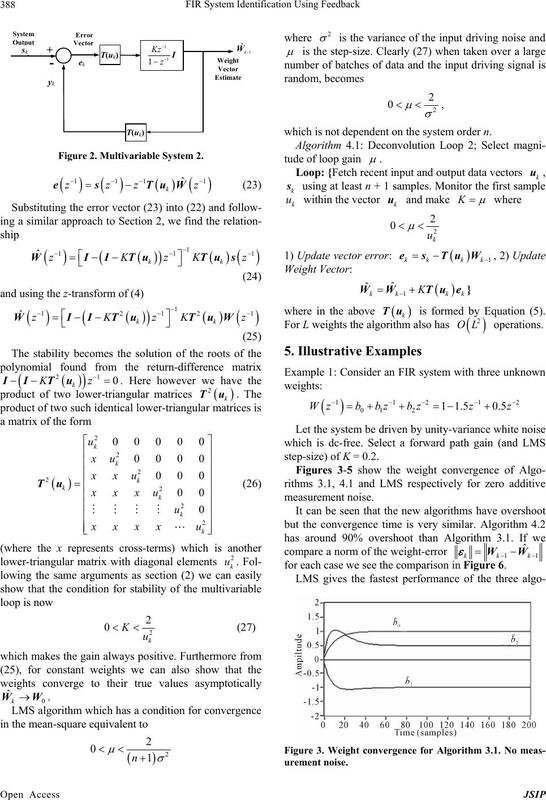 Multivariable System 2.
which is not dependent on the system order n.
For L weights the algorithm also has operations. 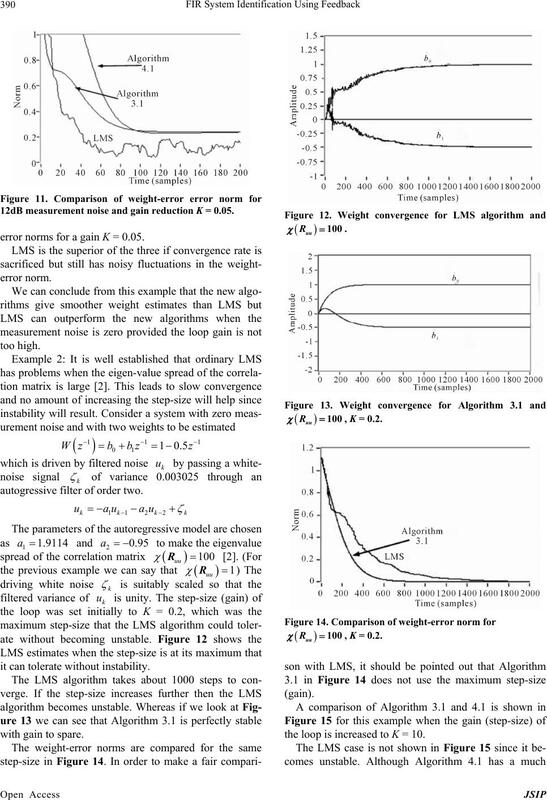 step-size) of K = 0.2.
for each case we see the comparison in Figure 6.
opposed to LMS which has a scalar error. Figure 7. Weight convergence for Algorithm 3.1. 12d B SNR. Figure 8. Weight convergence for Algorith m 4.1. 12dB SNR. ment noise and K = 0.2. 12dB measurement noise and gain reduction K = 0.05.
error norms for a ga in K = 0.05.
autogressive filter of order two. it can tolerate without instability. the loop is increased to K = 10.
rithm 3.1 in order to achieve the fastest convergence. rithm 3.1, K = 10 and . K = 15 and . ˆ0.378, 0.418, 1.416, 0.355, 0.2610.172W. ˆ0.999, 0.999, 1.499, 0.999, 0.25,0.249W. dependent on t he number of estimated weights. cuits,” IRE Wescon Convention Record, Vol. 4, 1960, pp. Prentice Hall, New Jersey, 1986.
gazine, Vol. 6, No. 2, 1989, pp. 4-21.
mation Theory, Vol. 23, 1977, pp. 377-384.
cursive Estimation,” MIT Press, Cambridge, 1987.
tive Filtering,” Springer, New York, 2013. No. 6, 1998, pp. 3621-3626. IEEE of Circuits and Systems Magazine, Vol. 1, 2001, pp. 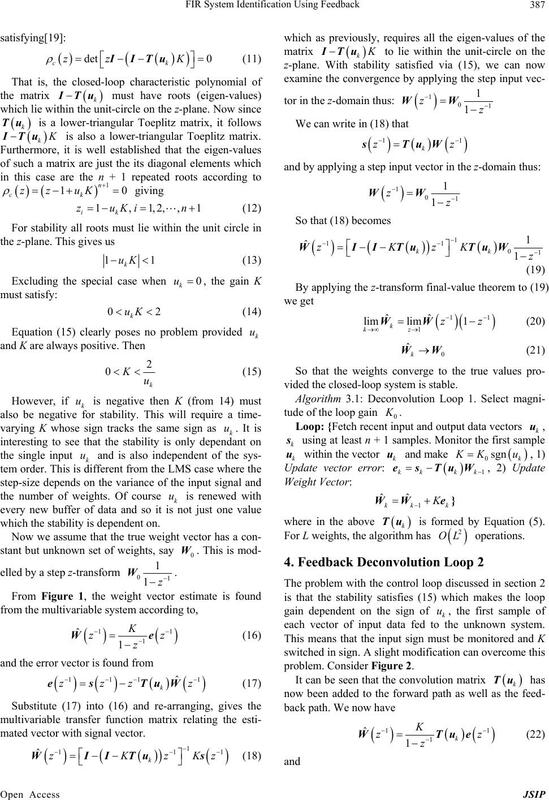 Signal Processing, Vol. 29, 1981, pp. 722-736. 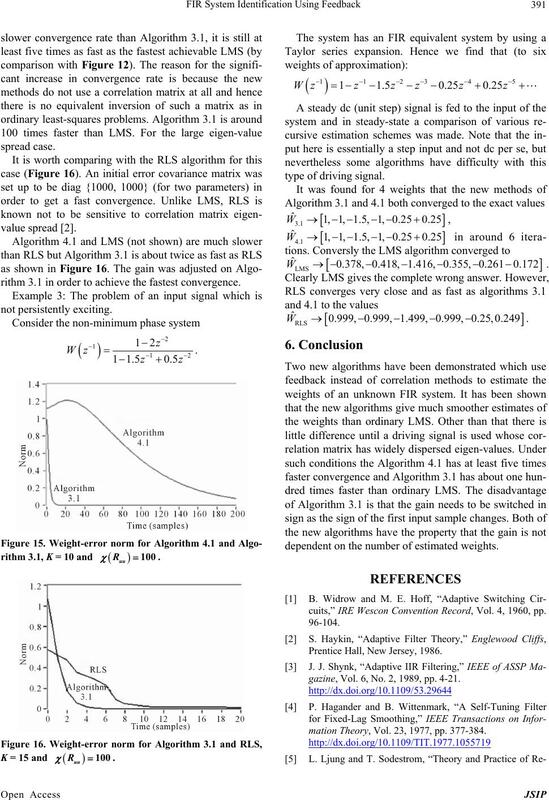 Signal Processing, Vol. 29, 1981, pp. 561-571. 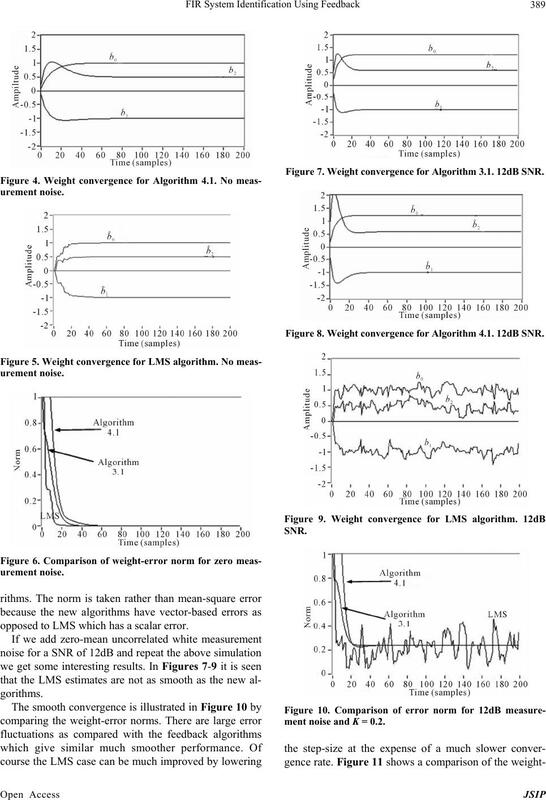 Signal Processing, Vol. 45, 1997, pp. 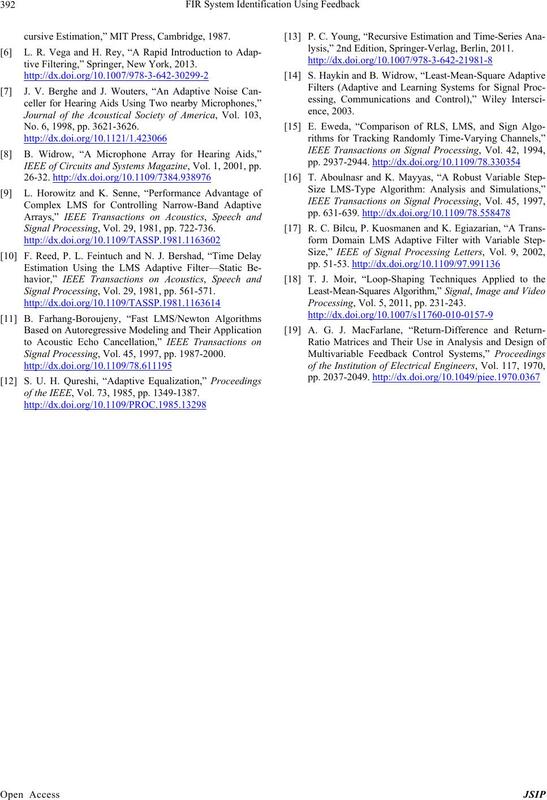 1987-2000.
of the IEEE, Vol. 73, 1985, pp. 1349-1387.
lysis,” 2nd Edition, Springer-Verlag, Berlin, 2011. Processing, Vol. 5, 2011, pp. 231-243. The time-varying matrix must have roots (eigen-value s) which lie within the unit-circle on the z-plane. This gives us the same as (13) for the stability limit on the gain K.
Due to its sparsity, such a matrix when raised to the same pow er as its dimensio n will always be zero i.e.